Kisan™ Kachchi Ghani Mustard Oil is renowned for its purity, aroma and taste. With a pungency level of 0.27 percent, higher than the highest AGMARK standard of 0.25 percent, Kisan™ Kachchi Ghani Mustard Oil is the best oil for cooking, massage, pickles and other religious and ayurvedic purposes. We are also offering Natural Mustard Oil, Refined Mustard Oil and Natural Mustard Seed Oil. We are offering Cooking Mustard Oil to our client and our product is made of good quality. To preserve the naturality and aroma of Kisan Mustard Oil, a virgin quality 200 ML pet bottle packaging is serve to its consumer. Uncap the bottle and fill the nature in its true form. 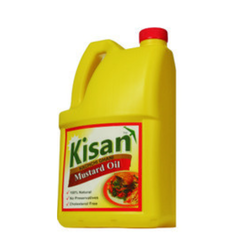 To serve all sector and variants of consumer company is planning to launch Kisan mustard oil in 100 ML per bottle. 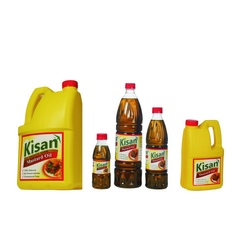 Kisan Kachchi Ghani Mustard Oil is renowned for its purity, aroma and taste. 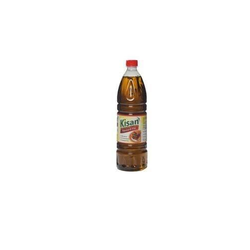 With a pungency level of 0.27 percent, higher than the highest AGMARK standard of 0.25 percent, Kisan Kachchi Ghani Mustard Oil is the best oil for cooking, massage, pickles and other religious and ayurvedic purposes. 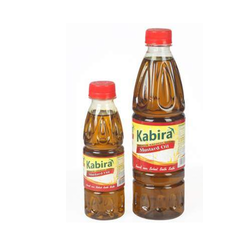 We are also offering Natural Mustard Oil, Refined Mustard Oil and Natural Mustard Seed Oil. A unique design virgin HDPE Jars is been developed to serve the packaging of 2 Ltrs Kisan Mustard Oil. The quality of jar is capable to preserve the naturality and pungent smell of kachchi ghani mustard oil.